$40 for rectangle (14X24) and square (14X14) signs, $50 for round signs. Pay at the event. Does not include food or beverages. You will choose your design from over 100 designs on our website at least one week prior to the event. At the event you will choose your own boards, assemble your sign, choose your stain color and all paint colors! No experience or artistic skills necessary! 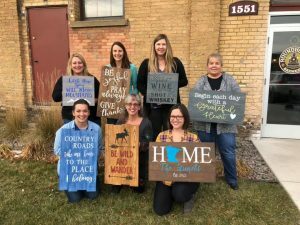 COMMENT on this event post, MESSAGE us on Facebook, CALL us at 218-831-2670 or email us at signaturesignsdiy@gmail.com. If you reserve a spot but need to cancel we understand, but PLEASE contact us ASAP to let us know as we usually have a waiting list and that spot can be filled. If you are reserving multiple spots please provide us with the names of your guest. Sign parties take about 2 1/2 to 3 hours.